Strengthen national and global systematics to predict, prevent, and manage invasive species to ensure biosecurity; public health; economic, environmental and agricultural security; and sustainability. Systematics expertise in all groups of organisms. An effective communication network linking Federal, academic, national and international taxonomic resources. An integrated, web-based information system that links organismal biology, geography, and taxonomy with interactive keys and collections data. Adequate human and physical resources for Federal systematics collections. A reinvigorated capacity and commitment by universities to prepare professionals in systematics. A culture that values and sustains its systematics resources. Has prepared a Situation Report "Protecting America's Economy, Environment, Health, and Security from Invasive Species Requires a Strong Federal Program in Systematics Biology" to create awareness of the crisis in systematics in Federal agencies. Will comprehensively survey Federal systematics capacity and needs. Will prepare a 10-year Plan, delineating actions and budget estimates for consideration by Agency and Congressional decision makers. This Plan will catalyze the strengthening of systematics resources for Federal agencies to predict, prevent and manage invasive species. Will promote ways to leverage the Federal effort through external partnerships, to reinvigorate universities' training capacity and to augment international efforts. 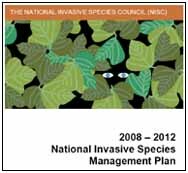 Phased in over 10 years, an enhanced Federal Systematics Program will better counter national security threats posed by invasive species -- whether introduced intentionally or not, will fortify a new generation of systematic biologists, and establish contingencies for continuing operations in case of a shutdown of the Federal government. Finalize, publish and disseminate paper "Strengthening the Federal Capacity in Systematics and Creating a Safety Net for Biosecurity". Finalize the Federal Systematics Survey, an agency data call related to federal systematics capacity and needs. Incorporate statistical analysis, survey expertise and web-based survey design for the data call. Identify agencies, conduct the Federal Systematics Survey, and analyze responses.